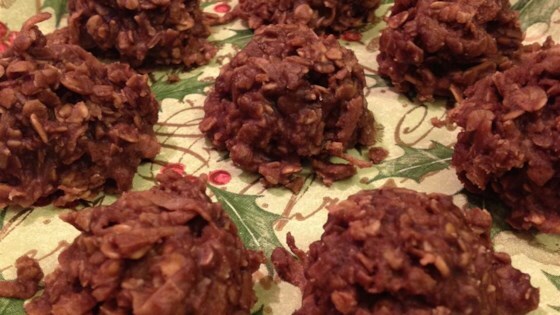 "No fuss, no bake, coconut, oatmeal, and chocolate cookies! One of our Christmas favorites! You can also freeze these! Enjoy!" Mix oats, coconut, and cocoa powder together in a bowl. Bring sugar, butter, and milk to a boil in saucepan, stirring occasionally; remove immediately from heat and stir into oat mixture. Drop 15 spoonfuls of batter onto a sheet of waxed paper. Cool to room temperature before serving. we used 1.5 cups of chocolate chips instead of cocoa, turned out great!! with a much more chocolate taste! !